Collect this year's "Horse Of The Year" holiday ornament. Ziporah is 2018's featured horse (sample depicted) and not only will you recieve this beautiful cermic ornament you will also recieve a certificate detailing Ziporah's recovery story as well as a professional photo of her happy and healthy! The Ziporah ornmanent is limited to 2018 only, so be sure to buy yours before the year is out! The ornaments are made of ceramic bisque (an unglazed, ivory-colored ceramic) and are 3 inches in size with a red ribbon for hanging. 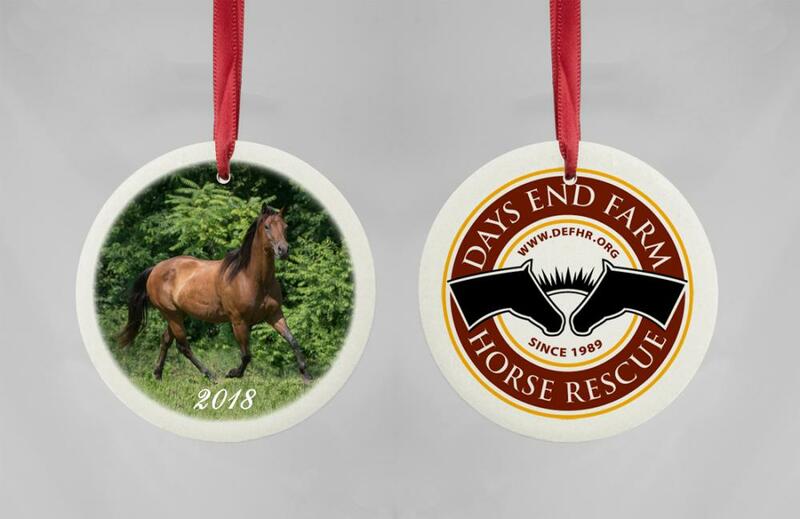 Every year we will be featuring a new ornament honoring a horse that captured the hearts of DEFHR supporters that year. Don't miss your chance to collect your this year's "Horse Of The Year" - ZIPORAH! Show your holiday support and get your orders in NOW in time to hang on your tree and/or to decorate your home for the holidays.